What's wrong with my babies? They were growing like crazy all summer but soon after I brought them in for the winter the leaves turned brown starting from the bottom leaves. I can think of two possibilities: 1) I let them dry out and 2) they are pot bound. I treied posting pics but am having trouble uploading. Re: What's wrong with my babies? Let them dry out, they are dormant this time of year and don't use very much water. 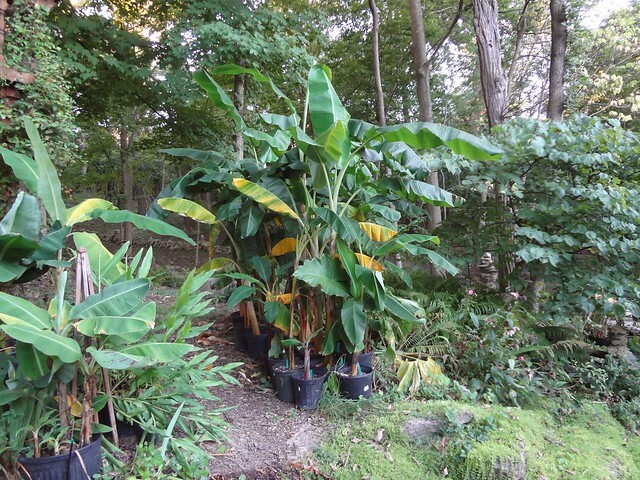 Over watering in the winter will kill your Bananas. Your pics may be too large, make them 2MB or smaller. Last edited by Iowa : 12-06-2018 at 09:20 PM. Are those heat lamps too close? Maybe they are drying them up? No, John, I tested by putting my hand between the lamp and the leaf. Also, it is not a heat lamp but provides supplemental light. How is your fertilization? What temperatures are you exposing it to during your areas winter? Looks like it could possibly be a Potassium deficiency if the temps are not the problem. Oh, I haven't fed them since I brought them in in October. I use Foliage Pro 9-3-6 fertilizer. The temps have ranged from 55 at night to 68 F days. I can't provide higher temps at night because our furnace died and the only heat we have is from the fireplace insert which I feed with wood only during the day. Those temps shouldn't cause damage like that. Let them dry out, then check the PH of the soil (to make sure they are capable of uptaking nutrients properly). Though you should remember that at those temperatures the plant will be near dormant (many of mine are growing slowly in temps from 40F-60F). Any changes you make will show very slowly. Don't over do anything. the transition from full sun to indoor light is always traumatic to the plants, they have a hard time supporting all the leaves and drop some, it's a shock on them and will take time to adjust, some will die and new pups will take there place, some will recover and slowly start putting out new leaves, either way don't worry, they will come back in the spring. Don't water more than once a week or less and don't fert. They were growing like crazy all summer but soon after I brought them in for the winter the leaves turned brown starting from the bottom leaves. Your plants will do that. As soon as your plants come inside they start to decline......one or two leaves at a time. Some of my plants start to decline as soon as the days grow shorter while still outdoors. Even with supplemental lighting larger plants like yours are somewhat harder and expensive to maintain. Take the advice from the other posts cutting back on water and such. Last edited by cincinnana : 12-02-2018 at 08:06 AM. A little off topic, are you the Vlad that grows citrus on the other forum? This tends to happen from Oct-Jan inside a house. They need really bright light and a good watering every couple of weeks. Once the sun is stronger in say early Feb they grow noticeably better if in front a big window.. Have they been growing in the last month or more or just declining?? Also were they always potted or did you dig them up? I figured this out a few months ago. I brought my potted bananas in during the last hurricane for few days. Shortly after that we had a random cold-spurt. There was some odd leaf wilting on a few of them. It was like the leaves were soaked, and a few days later the spots dried and curled. I thought it was caused by the 39*F night we had. But, we just recently got down to 31*F, and my bananas are in a small cold-frame hoop house. None of them showed the wilting. Though they are definitely drooping and turning a bit yellow. They have not been growing since I brought them in and they have always been in containers. As soon as the temps lower and days grow shorter activity for your plant will cease. Last edited by cincinnana : 12-04-2018 at 03:57 AM. Yes, that is me on the citrus forum. I have two Gros Michels potted that I took inside in October/November when temperatures were at 4 celsius. I had the same problem described here with my larger GM after taking both plants inside. 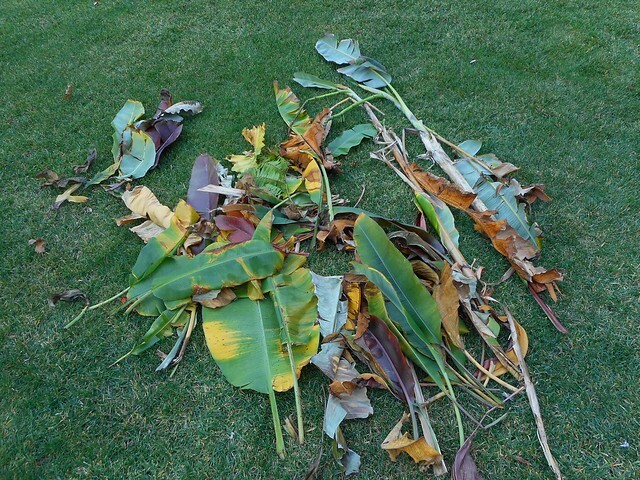 The plants were not showing distress out in the cold, but once inside the larger one immediately began wilting, and soon the whole plant just turned brown. I believe it was the temperature change and light change (under a lamp). So I drained it and cut it down. I recently put honey and calcium powder over the knob. Hoping planter soil will dry out. No issues with the other one. It kind of looked like it had the Panama Wilt disease. What temps are known to kill a GM?